Hollywood, CA – Moras Productions and M&F Entertainment have announced July 5th as the official release date for their indie film, 30 Days With My Brother. This announcement comes after the end of its limited theatrical release through AMC Theaters and AMC Independent™. The touching, emotional drama will be available on VOD through iTunes, Amazon, Google Play and YouTube for pay, as well as cable VOD through Time Warner, Comcast, COX and Bright House. During its short run at AMC Theaters this promising and encouraging story of two brothers had great reviews by both critics and the general public. Now the movie will be available to the public through VOD allowing its reach to expand to a broader audience. The public will have the chance to experience this little gem of a movie. 30 Days with My Brother will finally be available for viewers in the United States, Asia, Canada and Latin America on July 5th, 2016, but it can be pre ordered on iTunes as of June 6th, 2016. This is the first distributed feature film for many involved in this project. 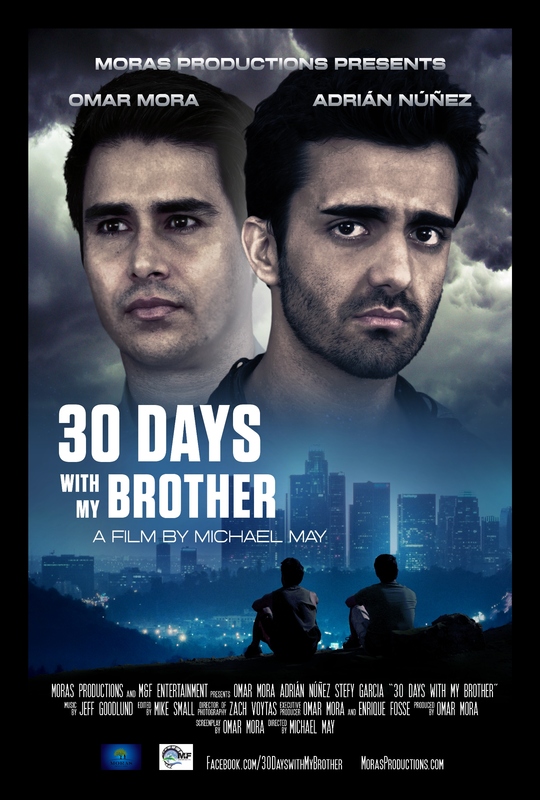 30 Days with My Brother is directed by Michael May and also features the powerful and moving performance of its stars Adrian Nuñez and Omar Mora. Mora also wrote and produced the film and is the first Puerto Rican born and raised on the island to produce a film resulting in national distribution in the United States through AMC Independent™. This feat is not to be taken lightly, as he has been working hard towards this goal since he began his writing career in 2012 with the intention of documenting his stories and producing them into feature films. Mora is a member of the National Association of Latino Independent Producers (NALIP). It was through a workshop led by AMC Theatres’ Nikkole Denson-Randolph at the 2015 NALIP Media Summit that Mora learned about AMC Independent™. This workshop provided Mora with the knowledge and tools necessary to successfully distribute his film. A heart-warming drama, 30 Days with My Brother is the story of two brothers who are forced to confront their past, themselves, all while trying to restore their relationship as brothers. Starring Mora and Nuñez, 30 Days look at the lives of two brothers from Puerto Rico who are separated by tragedy at a young age. After 17 years the brothers reunite, one a doctor, the other a dark and embittered young man holding on to his rage caused by his upbringing. 30 Days With My Brother also features the wonderful talent of Stefy Garcia, Evelyn Michelle, Amy Schloerb and Enrique Fosse. The film was written by Omar Mora and produced by Moras Productions and M&F Entertainment. This is one of the official posters of Moras Productions first feature film, 30 Days with My Brother, and its expected release is late 2015-early 2016.